Home Food Healthy Scallop with Fruit Salad! If you’re keeping your health in check, this dish is perfect for you. 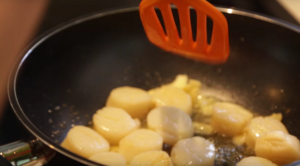 Healthy, natural and filled with different nutrients, the scallop with fruit salad is a tasty yet nutritious dish to fill your lofty health and taste standards. Scallops are a great source of protein, served alongside a colourful fruit salad that’s chock full of vitamins. 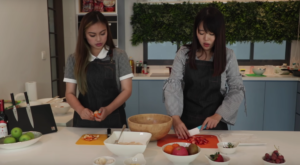 Foodie CaCa and Ms Kueh shares the recipe for this incredible dish. Look at all the fruit! Peel and cut the fruits to small pieces and slices. 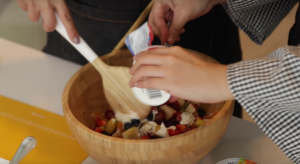 Grapes and blueberries does not need to be cut. When finished put all the fruits in the bowl. Take the two cups of yogurt and pour it into the bowl. Mix it thoroughly. 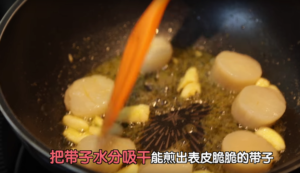 Pour a tablespoon of cooking oil, and place the scallop back into the frying pan. This will give the scallop more of the gold color. Voila! You have finished this wonderfully healthy dish that can be served to you and your family! Tell us how it taste below!!! Previous articleThe Beautiful Dolomites! : 4 Views that you have to see! Next articleOmakase at Marukyu! : No Menu No Problem!